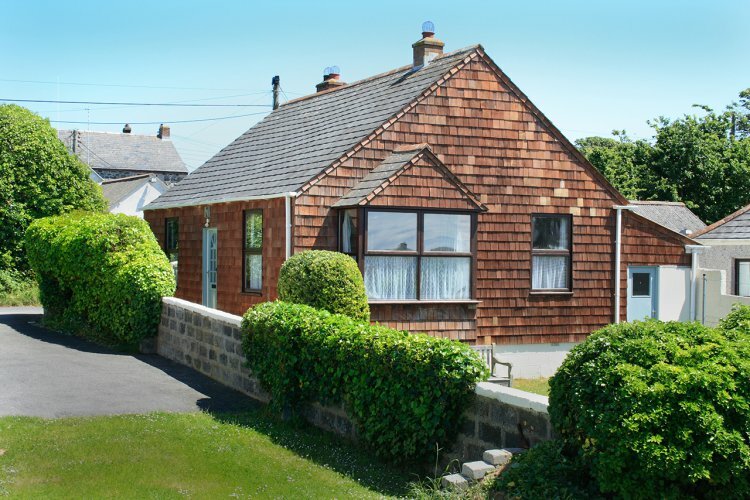 The Nook is a detached bungalow situated in a quiet location yet very close to the centre of Mullion village, Cornwall. Shops, restaurants, pubs, post office, etc are within easy level walking distance and there is off-road parking for up to two cars. Mullion Cove with its historic fishing harbour and the sandy beaches of Polurrian and Poldhu Coves are all about a mile from the bungalow. The property is entered up a couple of steps and into the bright hallway. The updated lounge is dual aspect and has a modern suite providing comfortable seating for five people, fireplace with electric 'flame effect' fire and LCD TV with DVD built-in and freeview. The window seat provides extra seating and there is a good selection of books and board games provided. The dining room has a table and six chairs, sideboard, Radio/CD/Tape player and walk-in shelved pantry. A small kitchen in solid pine includes electric cooker, fridge/freezer and microwave. Door to utility room with washing machine, tumble dryer and door to garden. The main bedroom has a double 4'6" bed, radio, dressing table, wardrobe and bedside cabinets. The large twin bedroom has two 3' single beds,(a bed rail for a child available if required) dressing table, bedside cabinet and built-in wardrobe. The brand new bathroom is fully tiled including a new modern white suite with electric shower over the bath, matching toilet and handbasin with shaver point and wall heater. Outside is an enclosed lawned garden with garden furniture and clothes line to the rear while parking for two cars is to the side. Rental includes bedlinen, towels and electricity. Heating throughout is by night storage heaters. Regret no smoking and no pets.